Talking Shop is an interview series where we talk to freelancers about freelancing. 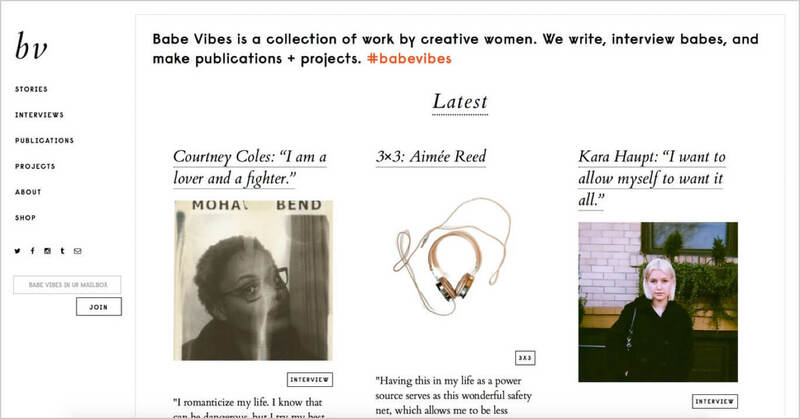 In this interview, we talk to Kara Haupt, former designer on the Hillary for America campaign and force behind Babe Vibes, a collection of work by creative women, in Brooklyn, New York. Kara Haupt: I was a weird teen. I was really into scrapbooking and would spend all my time on scrapbooking forums and blogs. I was homeschooled and didn’t really have much of an art education, so scrapbooking was a really incredible way to learn how to design. With scrapbooking, you're literally pushing pieces of paper around with your hands and figuring out how to tell a story through images and type. I went to college for photography, didn't like it, then transferred to school in Portland where I changed to design. Now I'm just making up my career as I go along. Most of us are. 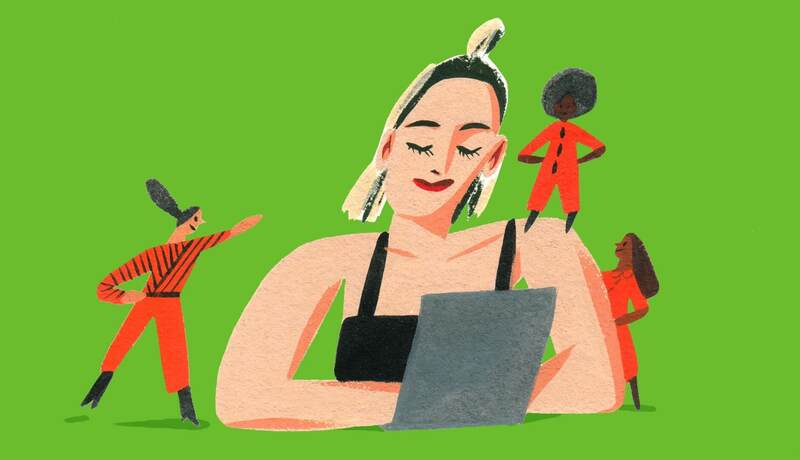 Looking at your past work with Babe Vibes and the Hillary Clinton campaign, it seems like your career has followed projects that you’re incredibly passionate about. Has that been intentional? Yes, and partially inevitable. Professionally, I've never really known how to get from one step to the next or how to get myself in the door. So, whenever there was a type of project I wanted to do, I would just make it up. That’s really shaped the work I’ve done moving forward. I’ve tried to be really aware of what kind of work I want to do and then put energy towards that. How did your role on the Hillary Clinton campaign come about? I moved to New York in April, so around that time, I was applying to places for work. Hillary’s offices were in my neighborhood, so I reached out. 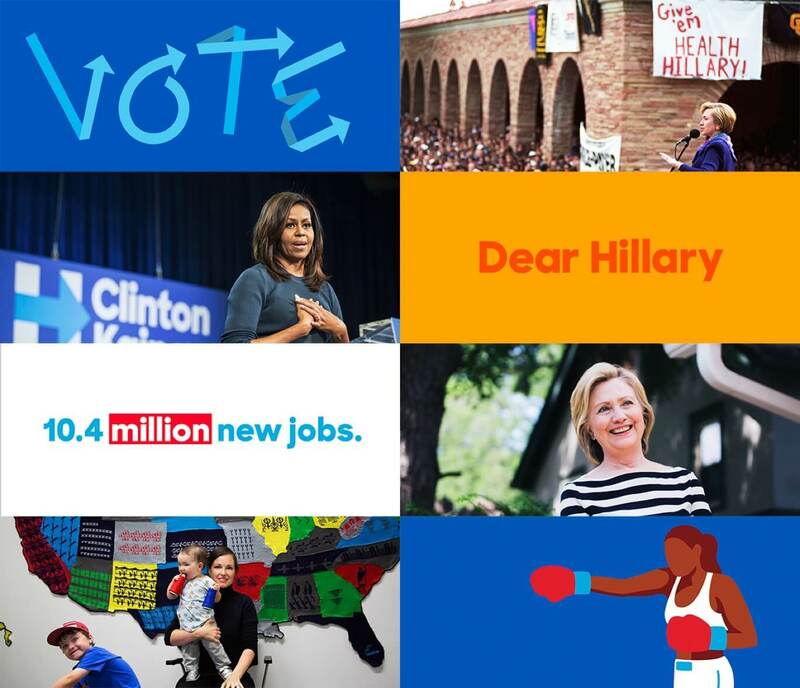 A few weeks later, I got an email from Jennifer Kinon, Design Director for the Hillary for America campaign, who invited me in for an interview. Everything came together from there. My role was working on The Feed, the campaign’s internal publication, which was a natural fit. As I worked on the campaign, my role shifted to being a co-lead for Content and Social design, where I focused more on the content design for The Feed, but also worked with my co-lead, Meg Vasquez, to support the campaign's social graphic design. Everyone says you can't get a job unless you know someone and that's mostly true, but this was a case of pure, cold emailing. Sometimes you just have to put yourself out there. They said that part of the reason they followed up was my work on Babe Vibes, which felt affirming and exciting. So, be pumped up about what you're doing. Your side projects can open doors, too. Were there any moments working on the campaign that really stand out to you? There was a lot of moments, particularly during the presidential debates and during the convention, that were really exciting. I felt this incredible amount of pride toward our candidate and the thoughtfulness that she put into her work. It was empowering to see this woman who has been doing something for her entire career deal with a lot of negative rhetoric and criticism, while all the while coming across as very pragmatic, thoughtful, and caring person. That had a really big impression on me, as far as how I want to function as a leader and as a person adding good to the world. I will think about Hillary Clinton every single day for a long time. Now, after the election, how are you feeling? Right now it feels really raw. I've been really angry about a lot of things. I spent six months on the campaign and it was some of the most emotionally grueling work I’ve ever done. I did a ton of graphic design work that I’m proud of, but I also spent the last week canvassing North Carolina. Walking door to door, having those conversations, had a huge impact on me. How can you be a good person in your community first? Chances are, it’s not always this glamorous, design-y thing. Many designers are asking what they can do now. Any advice? I think it's really good to see people really invested now, but I really wish that everyone would take a hard look at themselves and ask why they didn't do more before it came to this. I'm still frustrated by seeing a lot of design-related election projects, which — a lot of times — were very self serving or short sighted. Now I wish these people had taken some of that energy and put it towards digital organizing or take a week of their paid vacation and go to a swing state and canvas there. That's where I feel like change can actually happen. You can make smart and responsible decisions in your day job, but you have to supplement it with out-in-the-world activism to really have an impact. I know you write a lot of notes of affirmation to yourself. How does that fit into all of this? Kylie Jenner said that 2016 is the year of realizing stuff, which is hilarious and ridiculous, but I think about that a lot. We’re always are realizing stuff, but we forget it because we're constantly going. I try to surround myself with these notes as a way to remind me of what my goals are and who I am. They function like a weird diary. I post them on Instagram, so then they become this environmental art journal rather than something stuck in a book. It becomes this portrait of myself over the years and I find that really interesting. 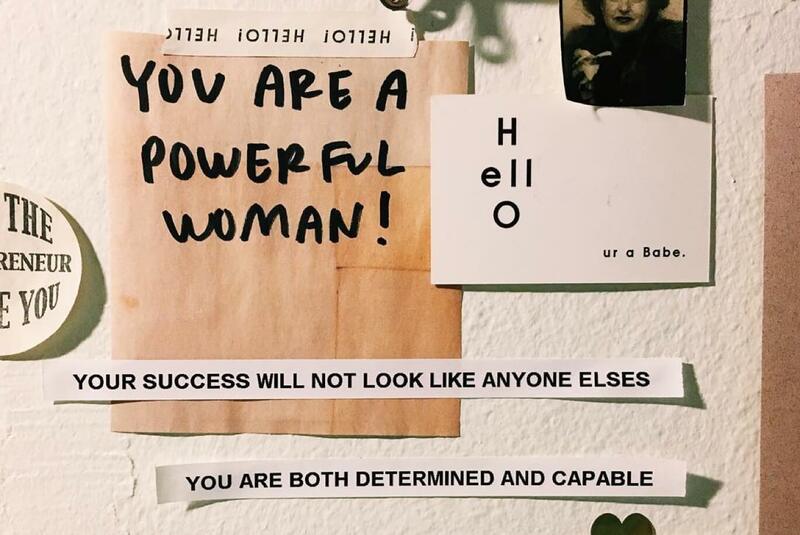 I have one right here that says, "You are a powerful woman." That one's been up for two years. I have, "Read or make money instead," which is my reminder to stop dating and that I should spend that energy on reading or making money. It's not going well. So, they're a bit aspirational a lot of times, rather than clear truths. Do you have any takeaways or advice for people who are looking to make more meaningful work? I think the first step is a very honest self-awareness, whether that means what you want or what the world needs. That's where so much of my own work starts from. You have to have that anchoring first. You can't start a personal project if you're not doing the work to care for yourself or figure out who you are. There are a few really practical ways to do that. You can go to therapy or you go on a walk every day or admit your faults and your blind spots and just shut up and listen to other people, because if you're out there moving your hands and not thinking, you're going to hurt yourself and a lot of other people in the process. I don't know and this is the first time that I haven't known for a long time. For the first time in my career, I have a lot more options than ever before. I thought that after the campaign, I was never going to work in politics again, but I feel like I can’t do that anymore. We have a lot of work to do. You can visit Kara Haupt’s website at karahaupt.com.